It was learned from the National Work Meeting on IPR trial on July 9 that, the number of cases of first instance handled by China has increased from 100,000 in 2013 to 213,000 in 2017, doubling over the past five years and remarkably growing in excess of 20% a year. The relevant official of Supreme People’s Court (SPC) said that the judicial function should be exerted to enhance the protection of renowned brands, encourage the good faith-based competition and curb the unfair competition like passing-off and free-riding. 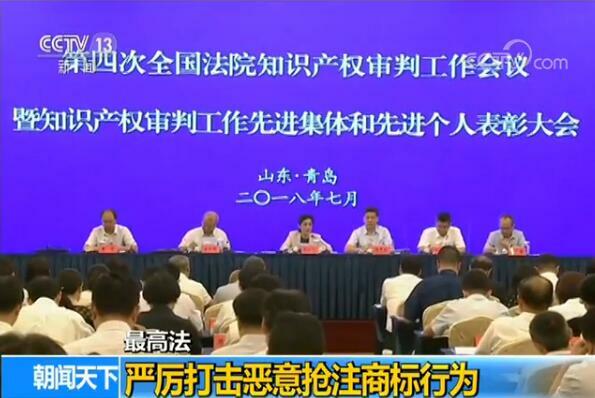 According to the SPC official, the protection of renowned brands should be strengthened and the acts of trademark attachment, passing-off and free-riding should be under tight crackdown in order to further purify the market competition environment. Tao Kaiyuan, Deputy Head of SPC: the current legal means should be fully utilized to firmly curb the act of malicious registration of trademarks and effectively regulate the order of trademark registration. Based on the principle of real use intention, the restraint on the applicants from hoarding the trademarks under Article 4 of the Trademark Law should be explored. As required by the SPC, the original achievements and cutting-edge results in the fields of Internet, big data and artificial intelligence should be cautiously treated. Tao added,the new technology and new business model should be cautiously treated. For those popular new technologies, new products and new business models that are difficult to figure out but are welcomed in the market, we should apply laws to them in a prudent manner and maintain the principles conducive to innovation, fair competition and consumers.